Sweet, berry flavor with the taste of raisins, juniper and marzipan. Creamy and warm in the finish and just something special that you do not get every day! 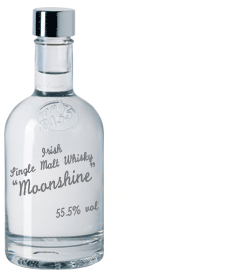 Our Moonshine belongs to the genus of the so-called Poitins, a precursor of whiskey and shows impressively, which beautiful array of aromas a fresh distillate can have.